While awaiting trial in Israel, as quoted in LIFE magazine (5 December 1960). Over the years I learned which hooks to use to catch which fish. Audiotape recording of Eichmann in Argentina (1957), as quoted in Eichmann Before Jerusalem: The Unexamined Life of a Mass Murderer by Bettina Stangneth (2015). ISBN 978-0307950161. Regret is something for little children. During cross-examination at his trial, session 96, July 13, 1961, as quoted in Eichmann Before Jerusalem by Bettina Stangneth (2015). It was actually an achievement that was never matched before or since. About the deportation of more than 400 000 Jews from Hungary in several weeks as quoted in Eichmann Before Jerusalem by Bettina Stangneth (2015). As quoted in "The Eichmann Memoir" in The Personalist Volume XLII (1962). My political sentiments inclined toward the left and emphasized the socialist aspects every bit as much as the nationalist ones. Eichmann's memoir False Gods, quoted in Gotz Aly, Hitler's Beneficiaries. How the Nazis Bought the German People (London: Verso, 2007), pp. 16-17. I was never an anti-Semite. … I personally had nothing to do with this. My job was to observe and report on it. As quoted in Religion and Public Education (1967) by Nicholas Wolterstorf. I was never an anti-Semite. … My sensitive nature revolted at the sight of corpses and blood... I personally had nothing to do with this. My job was to observe and report on it. As quoted in Consensus and Controversy: Defending Pope Pius XII (2002) by Sister Margherita Marchione, p. 71. Before his execution in Jerusalem (1 June 1962), as quoted in Becoming Eichmann: Rethinking the Life, Crimes, and Trial of a "Desk Murderer" by David Cesarani (2006), p. 321. ISBN 978-0-306-81539-3. I hope that all of you will follow me. Mumbled just before being hanged, according to Rafi Eitan, an Israeli intelligence officer who was standing behind Eichmann during the execution, as quoted in Mitch Ginsburg, "Eichmann's Final Barb" in The Times of Israel, December 2, 2014. Hätten wir 10,3 Millionen Juden getötet, dann wäre ich befriedigt und würde sagen, gut, wir haben einen Feind vernichtet. … Ich war kein normaler Befehlsempfänger, dann wäre ich ein Trottel gewesen, sondern ich habe mitgedacht, ich war ein Idealist gewesen. If we had killed 10.3 million Jews, then I would have been satisfied and would say, good, we annihilated an enemy. … I wasn't only issued orders, in this case I'd have been a moron, but I rather anticipated, I was an idealist. 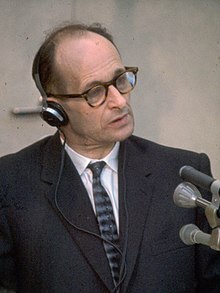 During cross-examination, prosecutor Hausner asked Eichmann if he considered himself guilty of the murder of millions of Jews. Eichmann replied: "Legally not, but in the human sense … yes, for I am guilty of having deported them". When Hausner produced as evidence a quote by Eichmann in 1945 stating: "I will leap into my grave laughing because the feeling that I have five million human beings on my conscience is for me a source of extraordinary satisfaction", Eichmann countered the claim saying that he was referring only to "enemies of the Reich". Great World Trials; The Adolph Eichmann Trial 1961 (1997) pages 332-337. I have them completely in hand here, they dare not take a step without first consulting me. Letter to Herbert Hagen about the Jewish community in Vienna (1938), as quoted in Eichmann Before Jerusalem: The Unexamined Life of a Mass Murderer by Bettina Stangneth (2015). It was my job to catch our Jewish enemies like fish in a net and transport them to their final destination. As quoted in The Nazi Hunters by Neal Bascomb (2013). ISBN 978-0-545-56239-3. My heart was light and joyful in my work, because the decisions were not mine. At his trial, as quoted by Alan Rosenthal, "Eichmann, Revisited" in The Jerusalem Post (20 April 2011). I knew that in this 'promised land' of South America I had a few good friends, to whom I could say openly, freely and proudly that I am Adolf Eichmann, former SS Obersturmbannführer. Meine Flucht, a memoir written by Eichmann in 1961, as quoted in Eichmann Before Jerusalem by Bettina Stangneth (2015). In Hungary in 1944, Eichmann introduced himself this way: "Do you know who I am? I am a bloodhound!" Eichmann Before Jerusalem by Bettina Stangneth (2015). After the [Wannsee] conference, Heydrich, Müller and myself sat cozily around the fireplace. We had drinks. We had brandy. We sang songs. After a while, we got up on chairs and drank a toast. Then we got up on the tables and went round and round. On the chairs. On the tables. Then we sat around peacefully, giving ourselves a rest after so many exhausting hours. As quoted by Alan Rosenthal, "Eichmann, Revisited" in The Jerusalem Post (20 April 2011). Eichmann boasted about anything that seemed at all plausible to him: his genuinely close ties to the highest powers in Hungary; his somewhat indirect contact with the powers of the Third Reich; his access to everything from a "personal aircraft" to direct control of the gas chambers at Auschwitz. ... He threatened his victims with the prospect that after the "final victory," Hitler would make him "World Commissar of the Jews." After the speech he looked at us ironically and added softly: "Otherwise you would die". The words were icy but the tone like velvet, almost friendly. Benjamin Murmelstein, Theresienstadt: Eichmanns Vorzeige-Ghetto, ISBN 978-3707605105, as quoted in Eichmann's Jews: The Jewish Administration of Holocaust Vienna, 1938-1945 by Doron Rabinovici (2014), ISBN 978-0745646824. The language becomes entirely perverted where Eichmann turns metaphors on their heads, talking about expulsion and murder using gentle images of life. An institution for forced emigration was his "first child," where he was able to "be creative in my work." All the individual acts of robbery and expulsion that took place in Austria were committed to "provide [the country] with injections of Jewish solutions." Even exterminations and deportations were "born". This was why he felt so superfluous in Budapest, when he was forced to stop deporting people to Auschwitz: "As far as I know, I couldn't have done anything fruitful anymore" ... In Eichmann's language, he didn't send people to the death camps; the camps were "fed with material". Eichmann ... found all bureaucracy by definition tiresome. This was what staff were for. "These matters to do with bureaucracy," he explained to Sassen [in Argentina], "I just relied on my civil servants for them". He deployed these "living articles," like Ernst Moes and Fritz Wöhrn, as "bureaucratic brakes." Bettina Stangneth, Eichmann Before Jerusalem (2015). David Cesarani, Becoming Eichmann: Rethinking the Life, Crimes, and Trial of a "Desk Murderer" (2006), p. 175. ISBN 978-0-306-81539-3. I loved playing an open hand against all the Jewish political functionaries ... For me, 'open hand' is a winged word. As quoted in Eichmann Before Jerusalem by Bettina Stangneth (2015). I will simply not do penance. A text handwritten by Eichmann in 1956, as quoted in Eichmann Before Jerusalem by Bettina Stangneth (2015). Quotes from audiotape recordings of Eichmann speaking to Nazi friends in Argentina in 1957, transcribed by Bettina Stangneth and translated by Ruth Martin, published in Eichmann Before Jerusalem: The Unexamined Life of a Mass Murderer by Bettina Stangneth (2015), ISBN 978-0307950161. The original tapes are stored in the State Archives of Germany. As my chief, Gruppenführer Müller expressed it, they were sending in the master himself, so I wanted to behave like a master. I have to forge my weapons according to the strength of the resistance. While we were working with the Jews to solve the Jewish question, the others used the Jews as a means to an end, to milk them for their own ends.... And this is why there are still a whole lot of Jews enjoying life today who ought to have been gassed. They knew me wherever I went. Through the press, the name Eichmann had emerged as a symbol.... In any case, the word Jew ... was irreversibly linked with the word Eichmann. Much more power ... was attributed to me than I actually had. The men in my command had the kind of respect for me that prompted the Jews to effectively set me on a throne. It wasn't in our interests for the material to be used for labor in the concentration camps to arrive completely useless and needing repair.... Look, how can you make 25,000 Jews, or people, or let's say 25,000 cows, how can you simply let 25,000 animals just disappear en route? Have you ever seen 25,000 people in a pile? ... Have you ever seen 10,000 people in a pile? That's five transport trains, and if you pack them in the way the Hungarian police planned, then at best you'll get no more than 3,000 people in one transport train. Loading a train is a tricky business anyway, whether it's with cattle or flour sacks ... and so much more difficult to load it with people, especially when you have problems to reckon with. The only good enemy of the Reich is a dead one. In particular I have to add, when I received an order, I always carried out this order with the executioner, and I am proud of that to this day.... If I had not done this, they would not have gone to the butcher. I was here, there and everywhere, you never knew when I was going to show up. I was a traveler.... I was able to creep into every territory of our corner of Europe. Müller said to me once, if we'd had fifty Eichmanns, we'd have won the war for sure. And I was proud. That should have given you an insight into my interior - since you don't know me, not from within, and that is important. Nobody else was such a household name in Jewish political life at home and abroad in Europe as little old me. Every department was trying to squeeze everything possible out of the Jews, to winkle it out by threatening them with the big bad Eichmann. These Jew-treks, as I called them, were carried out in the most elegant way.... I can tell you today that I saw two bodies on the whole route, they were old Jews - it's clear, you can't make an omelette without breaking eggs. And were no eggs broken when much larger contingents of Germans marched from the East after 1945? I am one of those people who can't stand to see corpses.... But there is one good thing nature gave me. I can switch off and forget very quickly, without trying to.... I still have a very devout saying from my youth, and I always do it when I find something horribly unpleasant and I can't stop thinking about it. And in order to forcibly distract myself, do you know what I say? You'll laugh! "I believe in God the Father, and the Holy Spirit, born of the Virgin Mary, died under Pontius Pilate, suffered" and so on and so on, "was raised from the dead," and so on. I somehow realized early on, as a child - still a devout believer at that time, of course - that once I'd said that, I didn't think about anything else. I, "the cautious bureaucrat," that was me, yes indeed. But ... This cautious bureaucrat was attended by a ... a fanatical warrior, fighting for the freedom of my blood, which is my birthright, and I say here, just as I have said to you before: your louse that nips you, Comrade Sassen, does not interest me. My louse under my collar interests me. I will squash it. This is the same when it comes to my people.... what benefits my people is a sacred order and a sacred law for me.... I have no regrets! I am certainly not going to bow down to that cross! ... it would be too easy ... for me to pretend that a Saul has become a Paul. I tell you, Comrade Sassen, I cannot do that. That I cannot do, because I am not willing to do it, because I balk inwardly at saying that we did anything wrong. Before my people bite the dust, the whole world should bite the dust, and then my people. But only then! We would have fulfilled our duty to our blood and our people and to the freedom of the peoples, if we had exterminated the most cunning intellect of all the human intellects alive today. For that is what I said to Streicher, what I have always preached: we are fighting an enemy who, through many many thousands of years of schooling, is intellectually superior to us. Was it yesterday or the day before, or a year ago, I don't know, I heard or read: even before the Romans had their state, before Rome had even been founded, the Jews there were able to write. This is an understatement. They should have said, aeons before the Romans erected their state, aeons before the very founding of Rome itself, they were able to write. Look at the tablets of the Ten Commandments. Look at a race that today has recourse to, may I just say, six thousand years of written history, a race that has been making laws for let us say five thousand years or six thousand years - and I am not wrong, I believe, when I estimate a seventh millennium. The fact that the Christian church today makes use of this lawmaking is very depressing for me. But it tells me that this must be a race of the first order of magnitude, since lawmakers have always been great. And because of these realizations I fought against this enemy. Now through the vagaries of fortune, most of these 10.3 million Jews remained alive, so I say to myself: fate wished it so. I have to subordinate myself to fate and destiny. I am just a little man and don't have to fight against this, and I couldn't, and I don't want to. It is hard, what I have told you, I know, and I will be condemned for being so hard in my phrasing, but I cannot tell you anything else, for it is the truth! Why should I deny it? On the Lüneberg Heath, it was near where Bergen-Belsen had been, and everything round there smelled of garlic and it was all Jews, because who was buying anything at that time? Only the Jews, and then I said to myself, I, I who was bargaining with Jews over wood and eggs, I was amazed and astounded, and I thought you see - goddammit! They all should have been killed, and there those fellas are, doing deals with me, you know? The war with the Soviet Union began in June 1941, I think. And I believe it was two months later, or maybe three, that Heydrich sent for me. I reported. He said to me: "The Führer has ordered physical extermination." These were his words. And as though wanting to test their effect on me, he made a long pause, which was not at all his way. I can still remember that. In the first moment, I didn't grasp the implications, because he chose his words so carefully. But then I understood. I didn't say anything, what could I say? Because I'd never thought of a … of such a thing, of that sort of violent solution. … Anyway, Heydrich said: "Go and see Globocnik, the Führer has already given him instructions. Take a look and see how he's getting on with his program. I believe he's using Russian anti-tank trenches for exterminating the Jews." As ordered, I went to Lublin, located the headquarters of SS and Police Commander Globocnik, and reported to the Gruppenführer. I told him Heydrich had sent me, because the Führer had ordered the physical extermination of the Jews. … Globocnik sent for a certain Sturmbannführer Höfle, who must have been a member of his staff. We went from Lublin to, I don't remember what the place was called, I get them mixed up, I couldn't say if it was Treblinka or some other place. There were patches of woods, sort of, and the road passed through — a Polish highway. On the right side of the road there was an ordinary house, that's where the men who worked there lived. A captain of the Ordnungspolizei welcomed us. A few workmen were still there. The captain, which surprised me, had taken off his jacket and rolled up his sleeves, somehow he seemed to have joined in the work. They were building little wooden shacks, two, maybe three of them; they looked like two- or three-room cottages. Höfle told the police captain to explain the installation to me. And then he started in. He had a, well, let's say, a vulgar, uncultivated voice. Maybe he drank. He spoke some dialect from the southwestern corner of Germany, and he told me how he had made everything airtight. It seems they were going to hook up a Russian submarine engine and pipe the exhaust into the houses and the Jews inside would be poisoned. I was horrified. My nerves aren't strong enough … I can't listen to such things... such things, without their affecting me. Even today, if I see someone with a deep cut, I have to look away. I could never have been a doctor. I still remember how I visualized the scene and began to tremble, as if I'd been through something, some terrible experience. The kind of thing that happens sometimes and afterwards you start to shake. Then I went to Berlin and reported to the head of the Security Police. I'd like to say something about this last, about this last point of this terrible, terrible business. I mean Treblinka. I was given orders. I went to see Globocnik in Treblinka. That was the second time. The installations were now in operation, and I had to report to Müller. I expected to see a wooden house on the right side of the road and a few more wooden houses on the left; that's what I remembered. Instead, again with the same Sturmbannführer Höfle, I came to a railroad station with a sign saying Treblinka, looking exactly like a German railroad station — anywhere in Germany — a replica, with signboards, etc. There I hung back as far as I could. I didn't push closer to see it all. I saw a footbridge enclosed in barbed wire and over that footbridge a file of naked Jews was being driven into a house, a big... no, not a house, a big, one-room structure, to be gassed. As I was told, they were gassed with ...what's it called? … Potassium cyanide... or cyanic acid. In acid form it's called cyanic acid. I didn't look to see what happened. I reported to Müller and as usual he listened in silence, without a word of comment. Just his facial expression said: "There's nothing I can do about it." I am convinced, Herr Hauptmann, [Eichmann is referring to his interrogator, Avner Less] I know it sounds odd coming from me, but I'm convinced that if it had been up to Müller it wouldn't have happened. I was sent to Treblinka, Minsk, Lemberg and Auschwitz. When I see the images before my eyes, it all comes back to me … Corpses, corpses, corpses. Shot, gassed, decaying corpses. They seemed to pop out of the ground when a grave was opened. It was a delirium of blood. It was an inferno, a hell, and I felt I was going insane. Because I have seen hell, death and the devil, because I had to watch the madness of destruction, because I was one of the many horses pulling the wagon and couldn't escape left or right because of the will of the driver, I now feel called upon and have the desire to tell what happened. Hannah Arendt in Eichmann in Jerusalem (1963), ch. 15. Not at all the man of the "banality of evil", as Hannah Arendt claimed, but an anti-Semite of limitless cruelty, ruthless and corrupt. Claude Lanzmann, The Last of the Unjust (2015), back cover. ISBN 978-2070106707. To the very last [at his trial], Eichmann appeared emotionless, a human iceberg. Only once did I see him show any expression other than injured innocence. Films of the concentration camps were being screened in the courtroom. The houselights were out, but from the control booth, on a monitor, I could see the close-up of Eichmann. As the corpses of Bergen-Belsen were bulldozed into their final pit, Eichmann, on camera, smiled. Alan Rosenthal, "Eichmann, Revisited" in The Jerusalem Post (20 April 2011). Eichmann's skill in [public relations] exceeded anything that Goebbels's clumsy propaganda could have achieved with its rabble-rousing articles. He was even able to inveigle the "enemy press" into spreading his lies for him. Bettina Stangneth, Eichmann Before Jerusalem: The Unexamined Life of a Mass Murderer (2015). ISBN 978-0307950161. Martha Gellhorn in Eichmann and the Private Conscience, Atlantic Monthly, 1962. There are more documents, testimonials and eyewitness reports on Eichmann than on any other leading Nazi. Not even Hitler or Goebbels has occasioned more material. And the reason is not simply Eichmann's survival for seventeen years after the end of the war, nor the impressive efforts of the Israeli police in collecting evidence for the trial: the reason is primarily his own passion for speaking and writing... Eichmann acted out a new role for every stage of his life, for each new audience and every new aim. As subordinate, superior officer, perpetrator, fugitive, exile, and defendant, Eichmann kept a close eye on the impact he was having at all times, and he tried to make every situation work in his favor. Bettina Stangneth, Eichmann Before Jerusalem: The Unexamined Life of a Mass Murderer (2015). The Jews looked upon him [Eichmann] and Hitler as the two Adolfs who perpetrated the Holocaust. Tom Segev, Simon Wiesenthal: The Life and Legends (2010), p.12, ISBN 978-0805212082. Before a subpoenaed gathering of all notable representatives of Judaism in Vienna, Eichmann flaunted his black SS uniform, his riding crop, and his knowledge of Judaism and Zionism. [Jewish historian] Adolf Böhm ... learned that Eichmann was one of his most avid readers, who knew whole pages of [his book] from memory. Böhm realized that the SS was going to use the knowledge he had painstaking gathered as ... a weapon against the Jews. I was a hospital nurse in Berlin where we had many visits from the SS, including Adolf Eichmann. He was young, good-looking, sleek, spotless, arrogant, and a smoker. While he was in the room, we had to stand up. He thought it was great merely to harass the Jews. We didn't know at that stage that he was in charge of the entire Jewish section [of the Gestapo]. He was constantly around our necks. That was his job. Gerda Schild Haas, as quoted in Our Crime Was Being Jewish: Hundreds of Holocaust Survivors Tell Their Stories by Anthony S. Pitch (2015). ISBN 978-1632206541. Incognito investigation was one of the tasks that Eichmann most relished, and he remembered it fondly decades later. He visited Jewish organizations, making contacts who thought him liberal-minded and eager to learn ... [but] between coffeehouse chats, memos, lectures, and evening conferences with his colleagues, he was meticulously keeping denunciation files and writing anti-Semitic propaganda, making arrests, and carrying out joint interrogations with the Gestapo. Franz Mayer, as quoted in Eichmann Before Jerusalem by Bettina Stangneth (2015). Jewish survivors also described the terror that Eichmann inspired: 'And then came Eichmann, like a young god; he was very good-looking, tall, dark, radiant in those days. The pictures of him today [at his trial in 1961] bear no resemblance to how he used to be.' In Vienna, he did not convey the image as he did in the trial in Jerusalem of the subordinate and banal official described by Hannah Arendt ... Eyewitnesses in 1938-9 speak of his anti-Semitic and imperious demeanour. He refused 'for ideological reasons' to shake hands with Jewish representatives or even Zionist emissaries. He berated, threatened and taunted the Jews. While he had still been a subordinate figure in Berlin in 1937, he took the initiative in Vienna to manage the terror and the persecution. He enjoyed his new work ... people could be jailed or deported to concentration camps at his command. Doron Rabinovici, Eichmann's Jews: The Jewish Administration of Holocaust Vienna, 1938-1945 (2014). ISBN 978-0745646824. His behavior, too, was godlike: he was master of arresting and then releasing people, of banning institutions and then allowing them to resume. He initiated and censored a Jewish newspaper and eventually even got to decide who could access the Jewish community's bank accounts. I was arrested on the street [in Vienna], brought to the Seitenstettengasse synagogue where I saw a group that was destroying everything ... with hammers, with axes, they broke the cult objects. And the one who was directing all this, it was specifically Mr. Eichmann... He was there, he was directing the operation... It was the SS ... they were in feldgrau [army gray], not in black. It was the first time that the SS weren't in black ... [Eichmann] was there with a crowbar. He smashed the cult objects to pieces ... Eichmann personally. But later, he ... invented a story ... that he went there to protect the building and the offices. Benjamin Murmelstein describing Kristallnacht 1938 in Vienna, as quoted by Claude Lanzmann in Le dernier des injustes (2015). ISBN 978-2070106707. We were naked when we stood in front of Adolf Eichmann and his helpers during selection on arrival at Auschwitz. Can you imagine how we felt, especially a woman, in front of them? ... He stood there with a dog and a thick leather horsewhip that was very thin at the end, which he pointed left or right. He took my mother to the other side. I cannot say I was brave. Perhaps it was inexperience, but I begged him, saying, "Please, she is the only person left in my life. I won't have anyone anymore." He struck me on the face with his whip so much that I swelled up like a balloon and could barely see through puffy eyes. He put me with my mother and that meant going to the crematorium. Guta Blass Weintraub, as quoted in Our Crime Was Being Jewish: Hundreds of Holocaust Survivors Tell Their Stories by Anthony S. Pitch (2015). ISBN 978-1632206541. By about the start of 1940, we knew that if a senior German functionary or an officer arrived, it was best to stay hidden, and not show your face on the street... People were saying you should have no contact with them, because there was one among them who was born in a German colony in Palestine, and spoke Yiddish and Hebrew, and was familiar with all the Jewish customs. Frieda Mazia about Eichmann, as quoted in Eichmann Before Jerusalem by Bettina Stangneth (2015). The story [that Eichmann was born in Palestine and spoke Hebrew] is a common thread winding through the public's perception of Eichmann ... in 1944 Eichmann used it offensively in Hungary to underpin his authority. Wisliceny used it to make the Jewish community afraid of his commander, who knew everything, could read everything, and - a masterstroke of caricature - looked so Jewish himself that he could move undetected among the Jews at any time. This terrifying scenario made such a lasting impression that after the war, people were frightened Eichmann might secretly have gone to Palestine, posing as a Jew, and could be hiding there among the survivors. Eichmann was personally a cowardly man, who was at great pains to protect himself from responsibility… He was amoral and completely ice cold in his attitude. Eichmann's deputy Dieter Wisliceny, as quoted by Alan Rosenthal, "Eichmann, Revisited" in The Jerusalem Post (20 April 2011). He was very upset that we had published something about him in that paper ... that he was ‘der Bluthund Eichmann’ (bloodhound Eichmann) - I am using the language [he] used at that time - ‘ Der Bluthund Eichmann,’ ‘blutunterlaufene Augen’ (blood-shot eyes), ‘ein neuer Feind,’ ‘Judenfeind’ (a new enemy, an enemy of the Jews). I don’t remember all the expressions, but they were very trenchant. Benno Cohn, as quoted in Eichmann Before Jerusalem by Bettina Stangneth (2015). Was Eichmann ever really the "man in the shadows"? Perhaps only during the short time he spent playing the SD commissar in a long leather coat, as feared and mysterious as a film noir villain. But by 1937 ... Eichmann became a symbol for anti-Jewish policy, exactly as he had planned. The symbol was perpetuated by other people's perception and by his own behavior, but it was also how he saw himself. The only difference in the postwar period was that he was elevated even further and held up as an isolated perpetrator ... thanks to his associates and accomplices' efforts to defend themselves. Hannah Arendt's "judgement" of Eichmann, in Eichmann in Jerusalem (1963). With his characteristically ambiguous combination of praise, irony, and an eye for a slogan, Reinhard Heydrich called Eichmann his "little prime minister." Charlotte Salzberger, as quoted in Eichmann Before Jerusalem by Bettina Stangneth (2015). Hannah Arendt in Eichmann in Jerusalem (1963) epilogue. Roger Cohen in "Why? New Eichmann Notes Try to Explain" in The New York Times (13 August 1999). In the Sassen tapes, Eichmann ... was not yet under the threat of the gallows, and he was not cautious. Here was Eichmann without any remorse, boasting and glorying in what he had done. Here Eichmann reveals himself as a passionate zealous man, happy to celebrate a weekend with his mistress at a Hungarian lake, slightly surprised to find that the killings and roundups in Hungary had gone so easily ... [The tapes] reveal an arrogant, boastful man, disdainful of his subordinates, totally indifferent to the fate of his victims and distant from his family. Capable of peacefully playing the violin at home, he is not above tearing up his wife’s bible and throwing it at her. He is a man cocooned in self-deception. Above all, he is a man passionate about his job and his mission ... Essentially a desk man, Eichmann fantasizes about himself in the [tapes] as a man of action and courage, deftly rewriting history in the process. This was no contented man in his fifties, reading for pleasure: the peaceable rabbit farmer was capable of throwing books against the wall and tearing them to pieces, filling them with aggressive marginalia, insults, and invective, and covering mountains of paper with his commentaries, writing like a man possessed. Pencils snapped under the force of his scribbling; his fighting spirit was unbroken. The ideological warrior had not been defeated ... His writing was not an attempt to comprehend his own actions; it arose from the fact that people were condemning the crimes he felt to be his life's work. Bettina Stangneth describing Eichmann in Argentina in Eichmann Before Jerusalem: The Unexamined Life of a Mass Murderer (2015). ISBN 978-0307950161. Gideon Hausner as quoted in The New York Times (27 June 1961). Denise Levertov in "During the Eichmann Trial". People knew exactly who was meant by "a repulsive, unpleasant fellow, you shake hands with him and you want to wash your hands afterward." Erring on the side of caution, Eichmann corrected this denunciation for his superiors: "I make sure I never shake hands with these Jews." If we had fifty Eichmanns, we would have won the war. Heinrich Müller, about Adolf Eichmann's devotion. Quoted in "And the Crooked Shall be Made Straight" by Jacob Robinson - Jews (1965), page 37. Eichmann became the "Nuremberg Ghost," ever present but impossible to lay hands on. His name haunted all the war crimes trials that followed. Eichmann is 34 or 35 years old, a very active, adventurous man. He felt that this act against Jews was necessary and was fully convinced of its necessity and correctness, as I was. Rudolf Höss [to Leon Goldensohn, April 9, 1946]. Eichmann continually managed to inveigle his Jewish negotiating partners into making concessions and cooperating, using nothing but their hope that by "negotiating" with him, they could prevent something worse from happening. How terrible their realization must have been that they were caught in a trap. On the transports, in the camps, and in direct sight of the apparatus of extermination, the Nazis' involuntary collaborators realized what they had been involved in. If they did not feel then, in this moment of realization, that they had fallen victim to a diabolical perpetrator, Satan in human form, then when? The terrible visions that emerged later of "Caligula" and "Grand Inquisitor Eichmann," the heartless monster, were rooted in these moments of unavoidable insight into the true aims of National Socialist anti-Jewish policies... "Eichmann" became the embodiment of this mechanism: it was the name the Jewish community representatives knew, and people trusted them. So the name walked abroad among the Nazis' victims, though the man himself was nowhere to be seen and was not immediately responsible for their suffering. This explains the memories of many Holocaust survivors of encounters with Obersturmbannführer Adolf Eichmann, when in all likelihood they never met him... the victims were able to see Eichmann in every jackbooted Nazi or arrogant inspector who screamed at them only because "Eichmann" had become much more than just a person. The name was the symbol and the guarantor of the power that was crushing people, and it no longer mattered who actually embodied and exploited it. The threat inherent in that name went far beyond what a faceless, nameless bureaucracy could ever have achieved. Penned in jail as he awaited his execution, the man who dispatched hundreds of thousands of Jews to their deaths in the gas chambers ended his days trying to convince the world he was a mere Nazi underling, a lickspittle who was only obeying orders and who went to the gallows tortured by regret at having been dazzled and led astray by the Third Reich's leaders. … time and again, he absolves himself of responsibility for the Nazi regime's horrendous crimes, painting a picture of himself as a nature-loving, simple, practical figure, who was brought up (in Austria, though he was German-born) to believe in discipline. He casts himself as a man who could not understand why his superiors kept embroiling him in death, instead of giving him the desk job he so coveted and clamoured for. A man who was horrified to witness the gassing of Jews in a mobile execution van. A man who loved his family, who made friends before the war with Jews and dissidents. … Almost every chapter contains an explanation of how little authority that he — the head of the Gestapo section in Berlin whose job it was to locate, deport, and exterminate Jews — actually held. Phil Reeves in "The Nazi Legacy: Eichmann" in The Independent (1 March 2000). The people who met [Eichmann in hiding]... met a pleasant man who didn't drink or gamble, organized a fair distribution of rations, knew his way around the "red tape," was intelligent and polite, and paid his rent on time. This charming man with the slight Viennese accent clearly didn't have a provincial upbringing. "He was such a quiet, unassuming person. On warm summer evenings he often played his violin for us. He played Mozart, Schubert, Bach and Beethoven" ... his general technical knowledge meant he could fix broken equipment, and he was the only one in the area with a radio, on which he particularly liked to follow the news ... even the children loved him: he helped tutor them and gave them chocolate. This page was last edited on 29 January 2019, at 01:40.